Before you can create a workshop run by another trainer, you need to invite this trainer to be your collaborator. If you haven’t done that yet, go ahead. When you have at least one category with collaborators, follow the steps below. First, open an event form by clicking Add Event icon in the top menu. 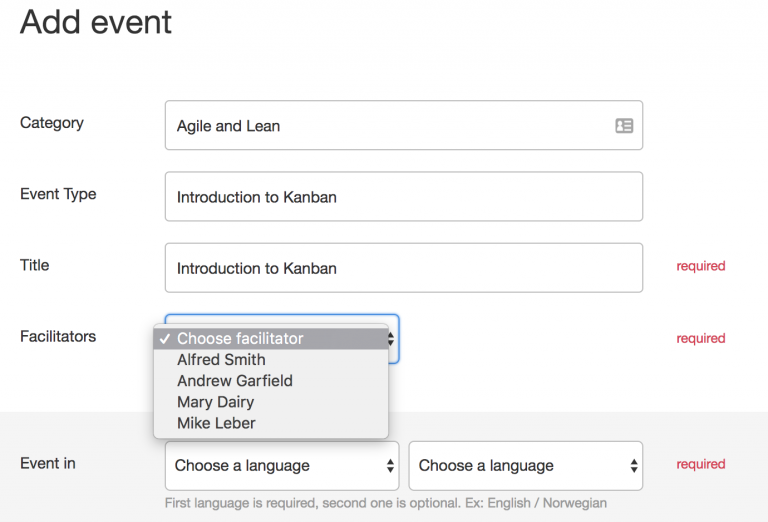 When you select a category with collaborators, new Facilitators field appears. It will contain all collaborators you added before. You can select as many of them as needed. Of course, your name will also be there. When you select one of your collaborators as a facilitator, additional field Notification policy appears. Using this field, you can configure how notifications will be sent to you and other facilitators. It usually depends on what you’re doing for this workshop: helping to promote and create, co-organising, or organizing. New attendee. You get it when a person registers for a workshop. New evaluation. You get it when a person leaves an evaluation for a workshop. In all scenarios, the workshop is visible on your website through the website integration, and registrations are possible. Standard. All notifications from Workshop Butler are sent to the facilitators of a workshop only. If you’re not a facilitator of the workshop, you won’t get any emails from us. Co-organiser. Notifications from Workshop Butler are sent to you and the facilitators, even if you’re not one of the facilitators. Organiser. Notifications from Workshop Butler are sent only to you. Use this option, when you take care of all interactions with attendees before or after the workshop.